We went to the beach last week, and in the spirit of relaxing, didn’t write anything blogworthy. One thing we noticed down there is that everybody beaches a little differently. For example, some people just park themselves in the shallow water and let waves splash up on them all day. Others swim out to deeper water. There were people throwing footballs and playing other games. Some people build sand castles, and some people fish. We like to begin and end the day with a long walk. We tend to spend the rest of the daylight hours sitting in the shade and reading, with occasional breaks to splash around in the ocean for a while. Almost every adult we saw was drinking beer, usually of the low-brow, mass produced variety. We like beer just fine, but we tend to get tired of it quickly. When it comes down to it, we can’t leave behind our cocktails for very long. In the picture to the right, you’ll see what we took with us. 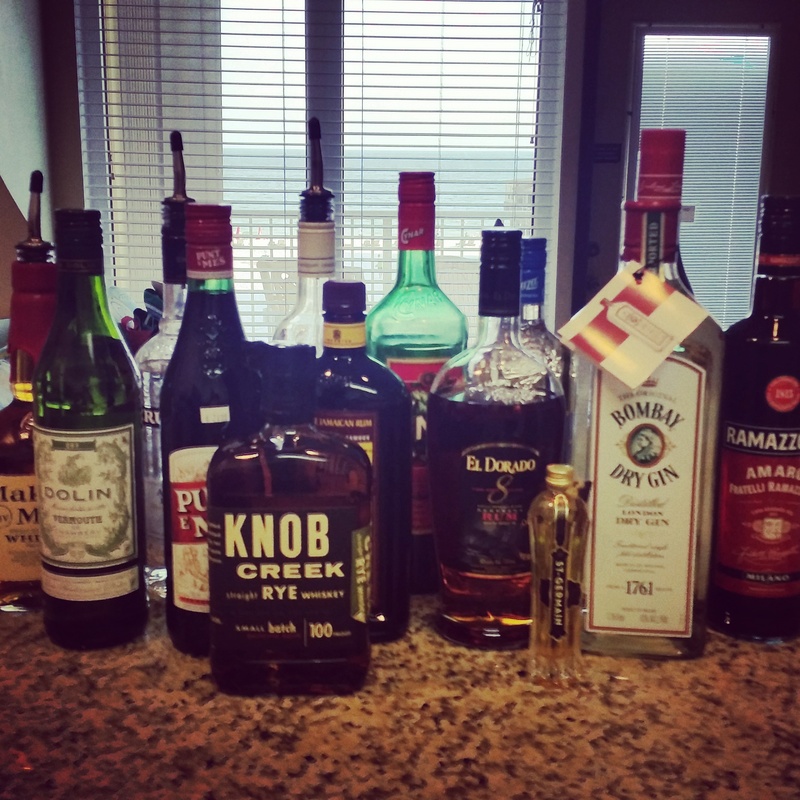 That’s just the liquor, of course. We also had lemons and limes, some fresh pineapple (pre-cut) and coconut cream for making pina coladas, sugar and honey for making syrups, a couple of shrubs, Angostura and Peychaud’s bitters, our top-secret homemade bloody mary mix, soda water, tonic water, and regular bottled water. Most people know that they can save a lot of money at the beach by staying in, but a lot of people think that means you have to settle for junk food and cheap beer. We ventured out a few times for food and drink, but it was hard to beat what we could make ourselves, especially after visiting the local farmer and fisherman’s market to get some fresh local veggies and seafood. And with the small portion of our bar that we travelled with, we were able to have top notch cocktails, better than what was available at any of the bars we visited. We were happy to find that the fridge in our rented condo made plenty of ice. We didn’t have to buy ice all week. The blender wasn’t all we hoped it would be, but it sufficed. Mornings, in addition to the obligatory coffee, we might have a shrub soda, a bloody mary, or an Americano with Ramazzotti amaro. Shrub soda was also a refreshing option for transitioning from the beach to the evening cocktail hour. For the beach, we batched cocktails in a pitcher, packing it in a cooler with ice and some plastic cups (and plenty of bottled water also). The pitcher might be filled with simple gin and tonics one day, margaritas another day, and fresh daiquiris on another day. In the evening, we might have a martini or a Manhattan before dinner (or a Sazerac, if we were feeling fancy). We went ahead and threw the lime quarters in with the g&t in the pitcher. After a while, the lime peel infuses with the mixture, making it extra delicious. We could have gone with a fancier tonic brand, but we were on a budget. Someone gave us a 2 oz sampler bottle of St. Germaine not long ago, which was great because we didn’t have to bring our big bottle from home. It was a perfect sub for the triple sec that we didn’t bring with us. This isn’t a true Hemingway daiquiri because we didn’t use grapefruit juice. The honey syrup was mainly because by the end of the week, we were running out of sugar, and it saved a trip to the store. It was delicious though. 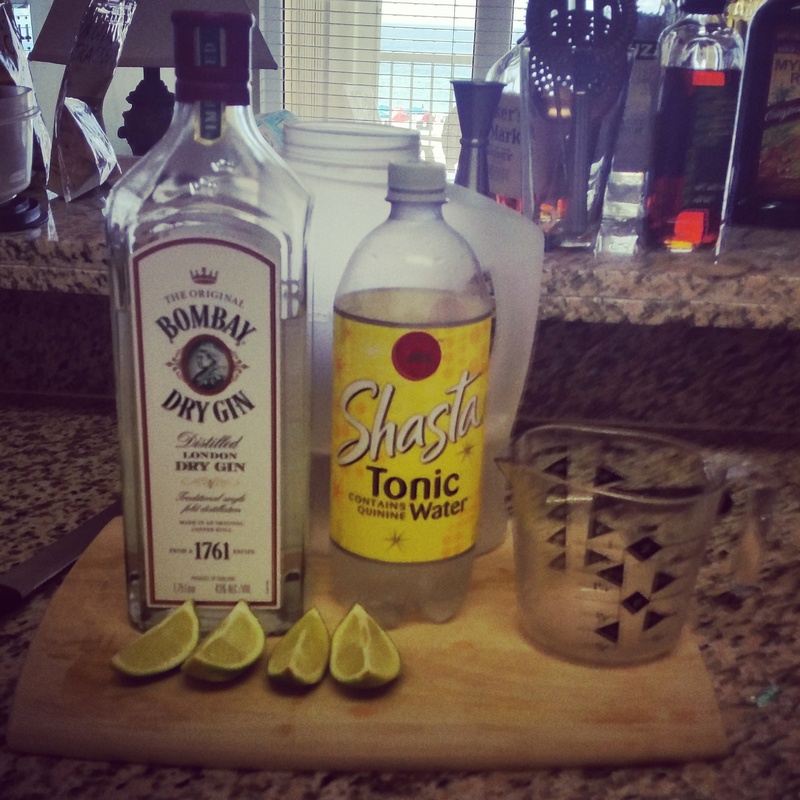 This entry was posted in recipes and tagged batch, beach, drinkwire.